One of the most appealing features in Java is the support for easy thread programming. Java provides built-in support for multithreaded programming. A multithreaded program contains two or more parts that can run concurrently. Each part of such a program is called a thread, and each thread defines a separate path of execution. Thus we can say that multithreading is a specialized form of multitasking. Imagine an online ticket reservation application with a lot of complex capabilities. One of its functions is "search for train/flight tickets from source and destination" another is "check for prices and availability," and a third time-consuming operation is "ticket booking for multiple clients at a time". In a single-threaded runtime environment, these actions execute one after another. The next action can happen only when the previous one is finished. If a ticket booking takes 10 mins, then other users have to wait for their search operation or book operation. This kind of application will result into waste of time and clients. To avoid this kind of problems java provides multithreading features where multiple operations can take place simultaneously and faster response can be achieved for better user experience. Multithreading enables you to write very efficient programs that make maximum use of the CPU, because idle time can be kept to a minimum. Inside run( ), you will define the code that constitutes the new thread. It is important to understand that run( ) can call other methods, use other classes, and declare variables, just like the main thread can. The only difference is that run( ) establishes the entry point for another, concurrent thread of execution within your program. This thread will end when run( ) returns. The limitation with this approach (besides being a poor design choice in most cases) is that if you extend Thread, you can't extend anything else. And it's not as if you really need that inherited Thread class behavior because in order to use a thread you'll need to instantiate one anyway. If you implement Runnable, instantiation is only slightly less simple. This constructor will createa thread from the runnable object. This constructor will create a thread with the name as per argument passed. So now we've made a Thread instance, and it knows which run() method to call. But nothing is happening yet. 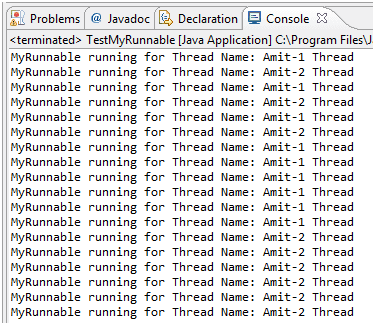 At this point, all we've got is a plain old Java object of type Thread. It is not yet a thread of execution. To get an actual thread—a new call stack—we still have to start the thread. Prior to calling start() on a Thread instance, the thread is said to be in the new state. There are various thread states which we will cover in next tutorial. A new thread of execution starts (with a new call stack). The thread moves from the new state to the runnable state. The following example demonstrates what we've covered so far—defining, instantiating, and starting a thread: In below Java program we are not implementing thread communication or synchronization, because of that output may depend on operating system’s scheduling mechanism and JDK version. We are creating two threads t1 and t2 of MyRunnable class object. Starting both threads, each thread is printing thread name in the loop. Thread objects can also be created by calling the Thread constructor that takes a Runnable argument. The Runnable object is said to be the target of the thread. You can call start() on a Thread object only once. If start() is called more than once on a Thread object, it will throw a Runtime Exception. When a Thread object is created, it does not become a thread of execution until its start() method is invoked. When a Thread object exists but hasn't been started, it is in the new state and is not considered alive.